The fourteenth Joe Pickett novel, STONE COLD, is an adequate installment in the long-running series starring crime fiction’s favorite Wyoming game warden. 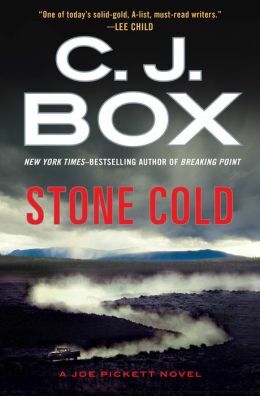 Long-time readers will enjoy the soap-operatic elements offered here – Box has created a grand supporting cast of characters who disappear and reappear throughout the series, and this entry features one particular unexpected return – and while it’s always a pleasure catching up with the Pickett family, it’s the core plot that lets STONE COLD down. Following on directly from the events of 2013’s BREAKING POINT, Joe Pickett finds himself working as a trouble-shooter for the governor, and assigned to finding out the truth behind the enigmatic rich stranger named Wolfgang Templeton, who is single-handedly keeping Medicine Wheel County afloat – but might also be funding a group of covert private assassins. Joe is sent in undercover – albeit, under his own name and occupation as a game warden – to determine the veracity of these rumors. Of course, it’s pitched as a simple assignment: observation only. And, of course, in typical Pickett form, he can’t help but get involved and raise the stakes . . . and instigate the possible return of series favorite Nate Romanowski to his life. And as this is happening, Joe’s eldest daughter Sheridan is spooked by an aloof boy in college, who she believes might have sinister intentions. When a few hunting rifles go missing, it seems obvious: something bad is going to happen, soon. The twin plots are simple, and unravel with great pace, but little surprise. New readers might find events uninspiring, while regulars will find some comfort in the novel’s minimalism, and relish the call-backs to previous novels, and the re-emergence of past characters. STONE COLD is a novel crafted for the loyalists, but even then, it’s one that falls into that middling category; it’s just not an installment that will live long in the memory, unlike its predecessor, BREAKING POINT. As a single entity, then, it’s not the best; but as part of the vast, complex collage CJ Box has been piecing together for fourteen novels now, it’s worthy of its place in the canon. And the ending suggests there’s more upheaval to come in the life of the Pickett’s.